I read this article and found it very interesting, thought it might be something for you. 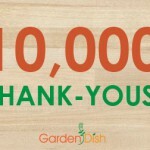 The article is called 10000 Thank-Yous and is located at http://www.gardendish.com/10000-thank-yous/. Today, we are giving thanks – for you. 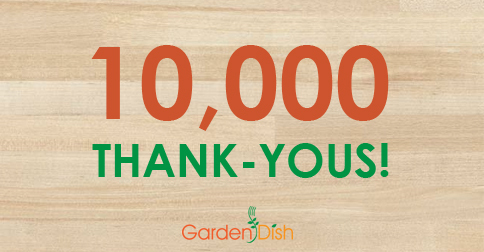 Today, your action and that of 9,999 others helped achieve a milestone: a community of 10,000 on the Garden Dish Facebook page. We are proud to be part of a community that includes you. Why? Because you are redefining the dinner plate, the breakfast bowl, and the lunch bag in ways that positively impact health, animals, and the planet. You and we are growing an exciting, world-wide community that is working to make vegan cuisine into the very best cuisine – the one that is the healthiest, most sustainable, most accessible, and most delicious. Easy and practical – so you can make them in your home kitchen. Made from the flavors of each season – so you can buy fresh, flavorful ingredients at the best prices from your local grocery store or farmers market. We didn’t know what we were getting into! But this crazy goal became a 12-month marathon of cooking, shopping, tasting, tweaking, remaking, retesting, documenting, photographing, nutrition calculating, posting, and most importantly… (drum roll please)… listening. You provided feedback and comments all along. You participated through Facebook, Pinterest, Twitter, email, and the website. You kept us pumped up throughout the year to keep those recipes coming, despite the long hours and occasional “flaming pitas of death”. And we’re so glad you did! So, thank you. Thank you. Ten thousand thank-yous for your important and valued contribution to this ongoing journey. Here’s looking forward to 2015! P.S. We’re already planning projects for 2015. Stay tuned and check your Facebook wall and email over the next couple of weeks for more info. As always, we look forward to your ideas and feedback! *All the recipes from this project are captured in The Monthly Dish, our subscription cookbook/shopping tool that serves up 20 seasonally-selected recipes for you and your family each month, all year.